From December 22, 2018, to January 25, 2019, over 800,000 federal employees were furloughed while the US federal government was shutdown. But for government employee, Kogod alumna, and current Alumni Board Member London McCloud, an opportunity arose in the midst of the shutdown. Her idea? To provide furloughed employees with free on-campus workshops and networking opportunities. 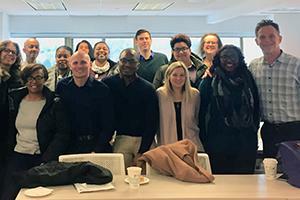 Both American University’s School of Public Affairs and School of Professional and Extended Studies (SPExS) hosted the free workshops, offering half to full day-long trainings on topics such as workplace mindfulness, project leadership and how to deal with change. Kogod professors Mark Clark, Caroline Bruckner, Alberto Espinosa and Tom Kohn, among others, all taught, free-of-charge. McCloud herself attended and found that the featured topics provided an avenue for both learning and networking. “When you bring together people who are like-minded and have the same interests, things flow,” she said. One class that stood out for McCloud was Tom Kohn’s entrepreneurship class titled “It’s Never too Late to Become an Entrepreneur.” In it, Kohn discussed how to be an entrepreneur, and the pros and cons of the challenges that come with the job. For Kohn, a strategic management professor at Kogod, volunteering to teach the class was a no-brainer. After submitting his idea to teach about entrepreneurship, he brainstormed the theme for the workshop with Jill Klein, Kogod professor and Interim Dean of School of Professional and Extended Studies (SPeXS), and quickly put together the different components of the class. After his workshop, Kohn had the opportunity to speak with a few of the participants and was inspired by their outlook of the furlough. Klein, who helped brainstorm and organize the opportunity, saw SPExS’ workshops (branded “AU4U”) as an opportunity to help a community in need.